Peru - IOM and the company SURA Peru signed an interinstitutional cooperation agreement that will allow the design and implementation of joint actions aimed at preventing trafficking in persons. The agreement was signed by the IOM Peru Chief of Mission José Iván Dávalos Saravia, the General Manager of SURA Asset Management Jorge Ramos Raygada, and Representative of SURA Asset Management, Alberto Garcia Haacker. Prevention activities to be implemented under this agreement will be addressed to the schools from different districts of Lima, which are vulnerable to this crime. During 2015, IOM and SURA Peru presented the theatrical play "Lita’s Nightmare" aimed at informing students about the crime of human trafficking in various public and private schools in the Peruvian capital. The performances were given by SURA Peru’s theatre cast composed of pensioners. As a result of the presentations, about 2,000 high school students saw the play, developed by IOM Peru. Following the presentations the reflection was complemented by dynamics and group work with students. The play had a high impact on the school population. 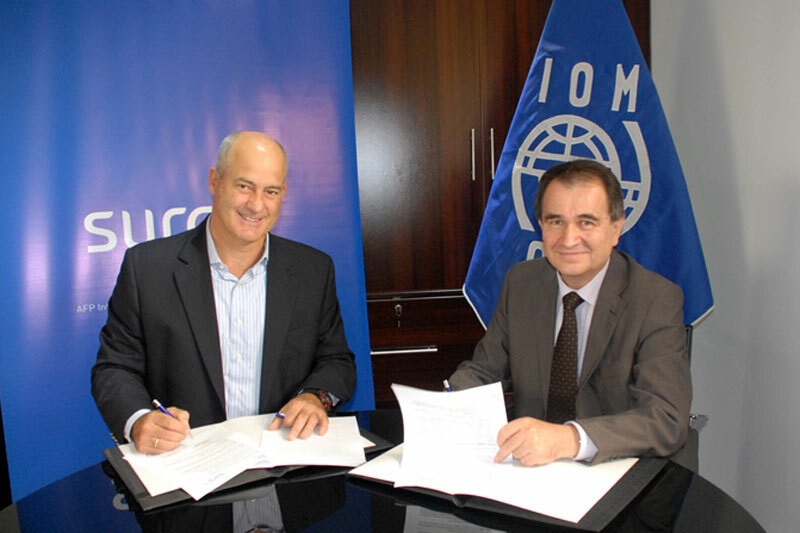 The agreement between IOM and SURA Peru will allow the continuation of joint work between both entities. The second half of 2016 will see the second stage of the prevention initiative with the project "A Theater against Trafficking" which consists of the presentation of the renewed play "Lita’s Nightmare" and sensitization sessions to be implemented with students. The play is expected to be presented in 14 schools in Lima while prevention efforts are estimated to reach 3,000 students by the end of this year. Furthermore, pilot workshops with students from four schools through which students create their own plays on human trafficking, after working with educators and artists will be included. The works will then be presented to the educational community. "The signing of this agreement will strengthen the commitment to the work we have done together by preventing and combating the crime of trafficking in persons which especially violates the Peruvian youth," said IOM’s Dávalos. Between 2009 and 2014, the Public Ministry of Peru identified 3,911 victims, of which 79.6 percent were women, 56.5 percent were minors and 86.2 percent had Peruvian nationality. The SURA Group is the leading business group regarding pension insurance, savings and investment in Latin America with 71 years of experience and more than 37 million customers. Specifically, SURA Peru has identified a set of issues that deepen their traditional lines of action with interventions designed to benefit especially the most vulnerable populations to improve their quality of life.